I can tell Christmas is almost here by the signs of growing stress while out and about. It all really starts on Black Friday … let me take that back, thanks to greedy merchants and blunt force trauma of Christmas advertising campaigns it really starts in mid-October. This premature blitz causes some serious angst with me as it is a clear war on my favorite holiday Halloween. Pretty sure the Kringle capitalists want to dispense with the orange and black and force a solid 3 month barrage of sleigh bells and, god forbid, horrible version after horrible version of Santa Baby. It may just be me, but by the time this traditionally festive time comes to a head I am worn out. Sure, I like to entertain myself by spending time at popular merchants observing frantic people desperate to fill the void under the tree or get that hot item that sold out … in October, but you have to feel a bit saddened to see the impact a once joy-centric event now has on society. Linda gives me a hard time about my tradition of going to the stores on Christmas Eve to experience this devolution – this is what psychology enthusiasts do for fun. I cannot speak for other countries and cultures, but if you happen to live in the US, take a look around and start assessing the happiness of those around you, especially on the road, in the parking lots and especially in the cashier lines – what percentage give the impression they are glad to be there? If they do look happy, they are probably psychology majors ha! 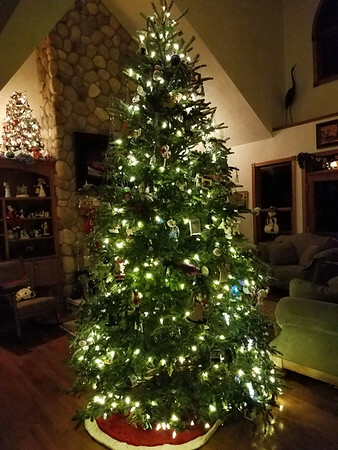 Feel bad about the downer opening, but really just hoping you can take a breath and remember the holiday should really be about family, relaxation and well, blogging! Finally worked up a long series for my other blog (ironically focused on Halloween), but before investing in that effort, thought I’d get another bird post out for my wildlife readers. Going with one of the big boys today. 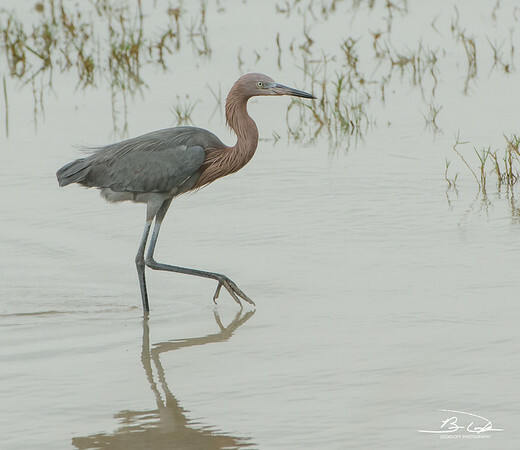 The Reddish Egret is not the largest of the shorebirds, but still tower over the standard peeps and plovers whose shorter legs force them to forage closer to the shore. 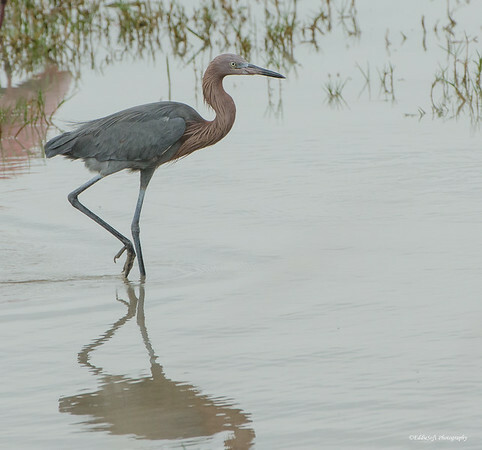 In fact, just the three toed foot of the Egrets are larger than some of those birds. Those other shorebirds don’t seem to be stressed by the size different, since I have never seen a Reddish, or for that matter any Egret, waste their time harassing the smaller birds – probably worried some stressed out piper trying to get a last minute Xmas gift will go medieval on them. Nope these Egrets are calm, cool and collected as they keep an eye out for an unfortunate frog (now, frogs do have a legitimate reason to be stressed). Hit the jump to see a few more shots of the two-toned Egret! Well, I had my annual wellness exam with my doctor today. Another year with “impeccable” (doctor’s word, not mine) health stats. A constant diet of running and lifting may take its toll on your time over the year, but it definitely pays off in the numbers. My employer also provides me annual comprehensive lab screenings so I knew the numbers going into today. Ironically, I came out of the office with a hole in my arm and an hour or two later I wasn’t able to lift my arm above my waist. Extremely healthy going in…damaged coming out thanks to my doctor convincing me I should get a tetanus shot with all the trail running. Probably a good plan – I do shed my fair share of blood during the course of the year with the Halloween props, work on the lot and ideas that do not go as planned – but damn this hurts. Making the most out of my gimpy fin, figure it never hurts to stay on top of the blog quota. 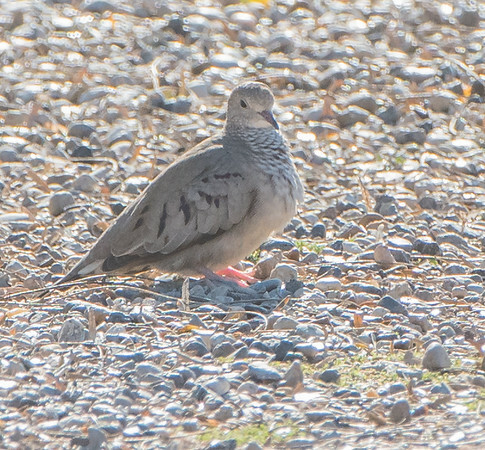 Keeping with the theme from the last post, tonight’s offering focuses on a bird that has previously debuted on the blog while trying to get as many Texas birds added prior to the Audubon speech (link here). 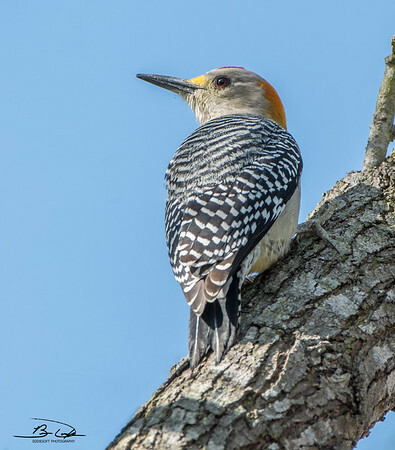 Like the Woodpecker, it was also found at Bentsen-Rio Grande Valley State Park (along the Rio Grande River) while on a birding trip to South Texas at the beginning of the year. Similar to the situation with the last post, the previous series was taken in rather harsh light. 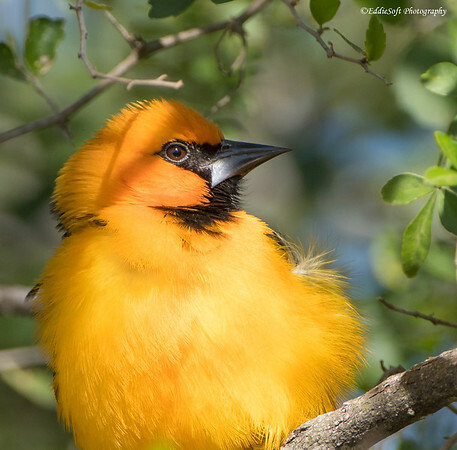 Hit the jump to see and read a bit more about this Central America bird. Hoped you enjoy the previous relief from the bird posts. I like to mix it up a bit from time to time, but the bird shots clearly dominate my photography queue – at least at the moment. Working on a few more non-feather series and hoping to get them finished up before too long. Until then, you are once again subjected to our winged friends. 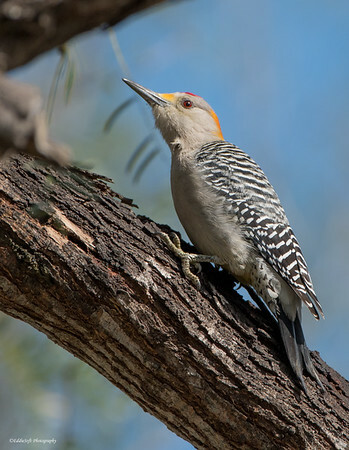 This series features the Golden-Fronted Woodpecker found on our trip to Texas back in the beginning of the year. This isn’t the first time this bird has been featured here at Intrigued. 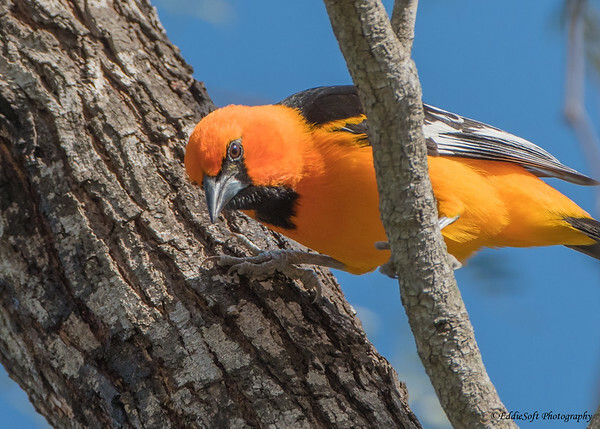 Back in February, this brightly colored species was honored from our trip to Texas in 2017 (link here). I personally think this is a better executed set of pictures – that first set suffered a bit from being in direct sunlight. Hit the jump to see more shots of the Golden-Fronted Woodpecker. Hello everyone! We are quickly approaching the end of another year of blogging – my 11th year to be specific – and hoping to get a few more posts out before Father Time turns over the hourglass. The good news is other than a few cleanups here and there I am officially on vacation until the New Year giving me plenty of time to get that done. Of course, there are Halloween props to build (yes, that is a year long activity), books to read, house projects to finally wrap up and fingers crossed, some birding to get to. Fortunately, I was able to get a lot of the images for upcoming musings done while traveling Sunday removing the most difficult part of the blog process. The birds have been dominating the slots as of late and therefore switching it up a bait .. err … bit. 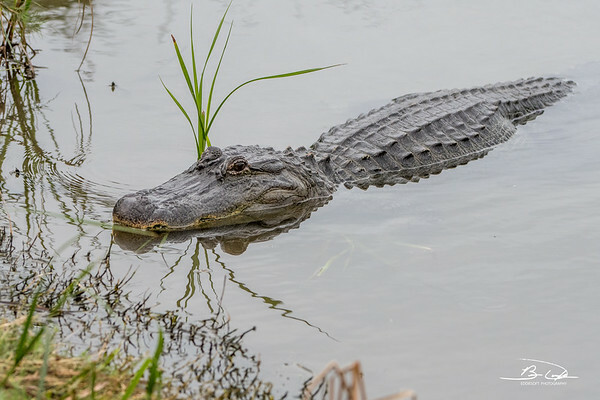 Nothing says Christmas like Alligators. Okay, maybe not, but I needed an excuse to feature this series of shots taken at the beginning of the year (note, that might seem a long time ago, but my back queue of shots has officially crested over 4 years – an embarrassing amount, but relieved to know my brother Ron having once chastised me for my inefficiencies is now experiencing a similar queue buildup ha!). 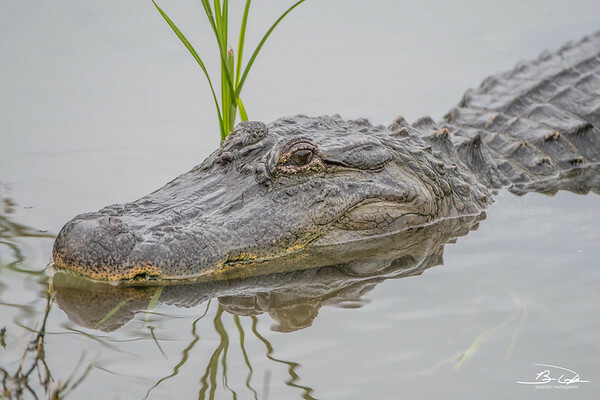 Our menacing looking specimen comes to us courtesy of South Padre Island Bird Viewing and Nature Center. Hit the jump to read a bit more about this menacing creature. Hit the jump to read a bit more about how this Dove made it into the tin. It is dog agility weekend which means I have plenty of extra time on my hands. That also means I can finally get a post out that I’ve had in the queue for a large part of this year. It may be surprising to know that book reviews are one of the most time consuming topics when it comes to to my efforts here at Intrigued. Photography posts are pretty straight forward – root through the massive image queue, find a set of shots my readers might find interesting, process them up and then do what I enjoy most, write about the experience. Book reports (wow, that sounds so grade school ha), do not have the image work beyond one or two quick snaps with my camera phone, but what it lacks in processing, it more than makes up for in recollection time. I spend a lot of capital on the takeaways, the concepts, quotes, thought provoking elements etc. that was gained from the investment in time with the author. Today’s feature recollection was so full of takeaways I was hesitant to start on it until there was plenty of time to really do it justice – so there the book sat on my desk, right next to my computer taunting me each and every day for a little more than 11 months. Today’s the day I address this visual guilt. As an avid reader, you soon realize there are times when you turn the last page of book and immediately think to yourself “that time investment was only slightly better than watching paint dry. Other times you might come away with a few good nuggets that make the investment worthwhile. Every once in a while, a book comes along that has a tremendous impact, influence and/or entertainment value. These time are easily identifiable by the shock of finality when you turn the last page. Almost a feeling of sadness knowing the strong bond you just made with an author has come to an end. There are only a few books that have led to this feeling. The Lone Survivor is one that comes immediately to mind (and some of the horror stories I was insatiably reading in grade school resulting in a warning to my parents from a snowflake teacher, but I’ll let that go for now). 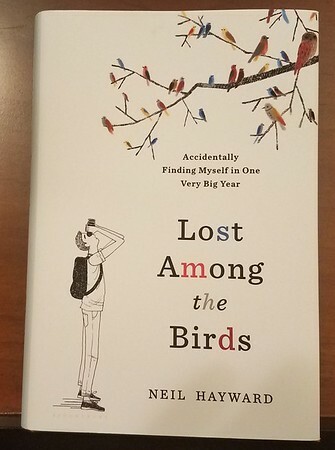 Now I can add another one to that distinguished list, Lost Among the Birds: Accidentally Finding Myself in One Very Big Year by Neil Hayward. This novel was found at the Laguna Atascosa NWR gift shop. I like to try and help out the various birding locations we visit especially when the visit results in new checks on the bird list – and Laguna has provided me a multitude of +1’s over the years. Admittedly, before finding and reading this book I wasn’t aware of who Neil was. The title looked interesting and who wouldn’t want to read about someone’s Big Year. Figured it would be an interesting read for the long ride back at the close of vacation. Little did I know at the time, how much I would look forward to turning these pages. Every page was a mixture of new bird knowledge, a better understanding of what it takes to try and get the most bird species checked in a single year (called a big year for the non-birders out there), personal exploration and laugh out loud humor (note, that humor may be more in tune within birding circles). A little background on Neil. He is a graduate of Cambridge and Oxford with a PhD in biology – the fruit fly nervous system to be exact. From this foundation he spent 11 years in a successful startup before deciding he needed to find himself… or at least better understand the depression that was taking over his life. A knowledgeable birder he decided to embark on a Big Year, although, I would characterize it as a Big Year found him rather than the other way around. One thing led to another and next thing he knew he was earning frequent flyer miles at a record pace traveling all over North America in search of new species to check off. It is on this adventure you learn about the depression that was taking root in his soul. At first reluctant to admit it, he slowly comes to grip with it while spending time on the best psychology couch there is – Mother Nature’s office. Through birding he learns to understand his mental state and reveals his thoughts to the reader as he progresses through the year, discovering himself almost as fast as he was finding new species. Along with this mental journey, Neil takes you to his most memorable birding spots, many of which Linda an I have also been to making the read all the more personal – a weird combination of elation knowing you have experienced the same bird coupled with a swell of envy as he tracks down a rarity. Through it all you begin to realize what a saint his new girlfriend (Gerri) must be to put up with his idiosyncrasies, unbelievable amount of time away from home and his inability to commit to the relationship in stark contrast to the commitment he had to those with feathers. This book had such and impact on me that I immediately went to Amazon and had a copy sent to my brother Ron knowing he would enjoy it just as much as I did. Maybe he will give his opinion of the read in the comments. I do not want to ruin the book in case you are intrigued enough to pick it up yourself, but I will reveal he does get an incredible amount of birds -in fact he had more birds checked off in the first month than I have on my life list after years of birding. In summary, if you are a birder and want to learn what it takes to compete at a Big Year level, then get this book. If you are not a birder but want to have a better understanding of what drives these crazy bird people, then get this book. If you want to read about the power Mother Nature can have on the human mind, then get this book. If nothing else, you simply want an enjoyable read, escape from the new world order of polarizing politics and crave some laughter to your life, then by all means consider Neil’s work as just the thing. Oh, almost forgot. If you are a birder, you will want to check out the listing in the back which has the chronological order of every species he found and where. Like me, you will probably find some places to add to your travel plans. 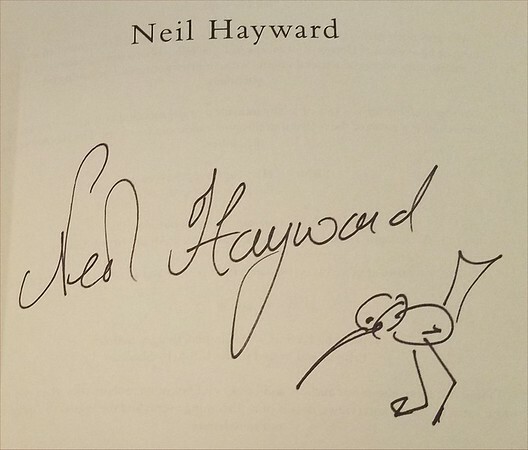 By the way, one of reasons this book caught my eye in the gift shop is that Neil had signed it! Hit the jump to see my takeaways – note, there are some spoilers in there, so if you are considering picking up a copy for yourself, you might want to wait to read these until after you have had a chance to feel the remorse when you turn the last page. We are officially in December now and thus time to walk over to the big counter on the wall and reset the monthly post quota back to zero – by the way, where the hell did this year go!?! I have single digit days left at work to get this year’s work efforts wrapped up and set the preliminary plan for 2019 before the holiday starts … sigh feel like a race I’m never going to get ahead of. However, on the bright side, I can tell you where a large portion of the year went thanks to crossing off one of my annual goals tonight. Anyone who follows either of my blogs know I spend my spare time bathed in sweat chasing down Father Time and running from the Reaper. During my Birding and Blogging talks this year I mentioned the reason I run (and lift) is so I can spend all day in the field hauling around big glass in hopes of taking pictures to display in my home gym to remind me why I work out – my circle of life. Always elated when I can check off a goal, let’s celebrate with some pie! Well, maybe not the pie you were thinking of. This here is the birder’s version. Actually, I took some liberties here – this is really a Pie[d]-Billed Grebe. If you live anywhere in the US or a large swath of Canada, you have ample chance to get one of this cute creatures in the tin. It is a rare outing when we do not come upon the Pied on one of our water excursions. You might have to keep your eyes open for reasons explained later, but they are probably there hanging out in small groups or more likely solitaire. 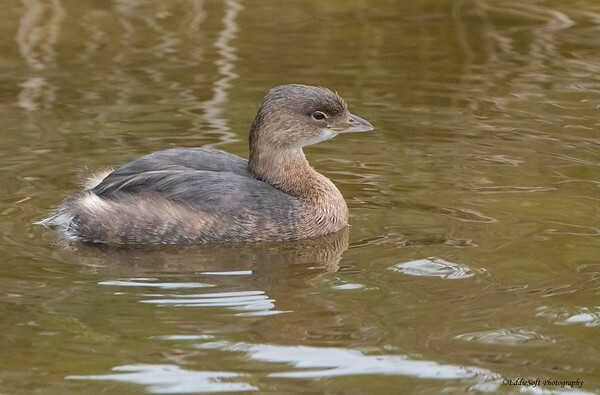 Hit the jump to see some cute picture of the Pied-Billed Grebe!